Namibian President Hage Geinkob with Portuguese President Marcelo Rebelo at the Global Visions Community/ Horasis Meeting 2019 in Cascais, Portugal on April 2019. PRESIDENT. 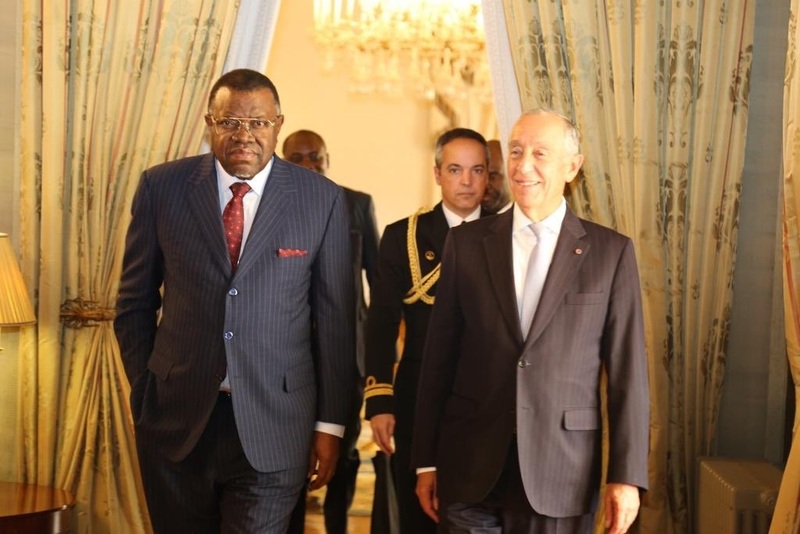 While attending the meeting, President Hage Geingob has extended an invitation to his Portuguese counterpart, Marcelo Rebelo de Sousa, to visit Namibia to deepen the existing relations between the countries. State House Press Secretary, Alfredo Hengari told NBC News Geingob’s request, during a courtesy call on De Sousa in Lisbon on Tuesday, further urged De Sousa to encourage Portuguese entrepreneurs to explore trade opportunities in Namibia. In this regard, a trade mission could form part of President De Sousa’s visit. I had excellent discussions in Lisbon with the President of Portugal, H.E Marcelo Rebelo De Sousa. We agreed on closer economic ties across sectors to stimulate growth and fight unemployment. I Shared Namibia’s investment-driven activities at the Horasis Global Meeting, Cascais. Hengari added the talks between the two leaders further centred on the need to review existing bilateral agreements between the two countries. According to the Namibia Statistics Agency (NSA), Namibia’s exports for 2018 to Portugal indicate a decline of 17,5%. However, Namibia continues to record a surplus in trade with the European country. The two countries trade mainly in frozen fish, marble, steel and charcoal. President Geingob was in Portugal to attend the Horasis Global Meeting, focusing on the benefits of globalisation for emerging economies. Hon. Maureen Hinda, Deputy Minister of International Relations and Cooperation with her counterpart Hon Teresa Rebeiro, the Deputy Minister of Foreign Affairs of Portugal, Nov 2016. Bilateral Relations: Portuguese Language Center: Namibia has two strategic bilateral agreements with Lisbon one is business trade and cultural agenda which mostly based on Portuguese language courses that offered to the government civil servants and agencies such as NAMPOL and, NDF to teach security officers to be multilingual and understand the Portuguese. Portuguese is a recognized foreign language in the Namibian education system spoken by many Namibians. The Camões Instituto Cooperação Da E Língua Portugal is a Portuguese institution responsible for the cultural agenda and global network in language communication. 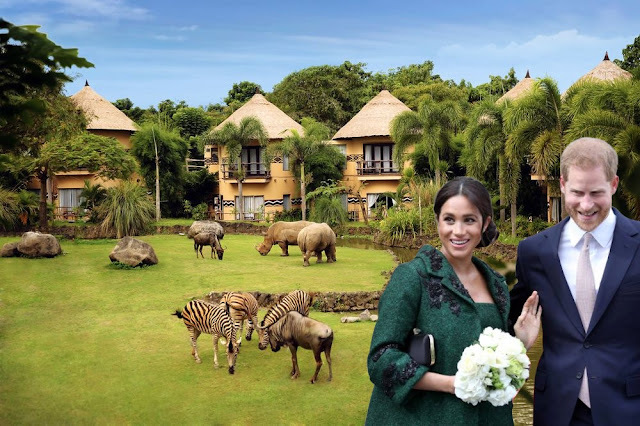 Its mission is fulfilled in the area of linguistic and cultural teaching, teacher training, research, and promotion of Portuguese over 82 countries include Namibia. Its action is developed in close collaboration with the Ministry of Foreign Affairs, and other ministerial entities, as well as education departments, and associations of Portuguese abroad. It is structured in 11 teaching Coordinations all over the world, as it promotes the learning of Portuguese language and culture adoption among children and young adults in 17 countries, mostly within the communities of Portuguese speaking countries as well as none lusophones. 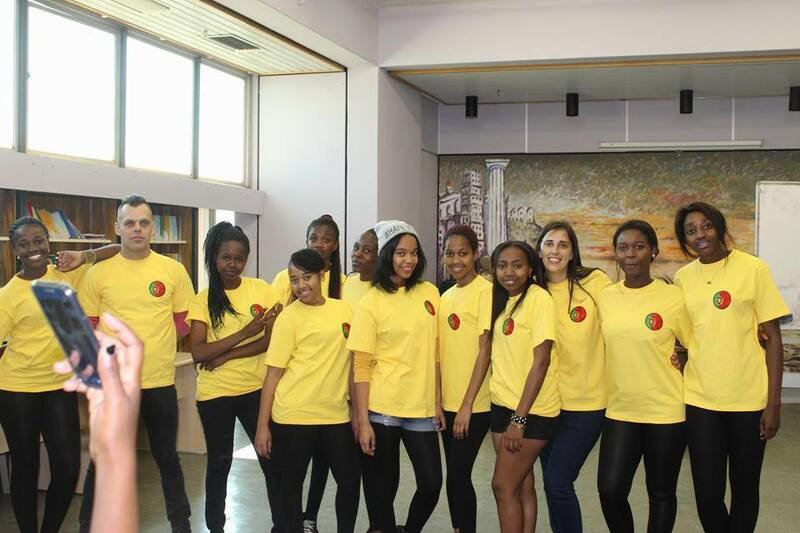 Namibian learners from Portuguese Language Center - Camões, I.P pose for photos, Windhoek. In Namibia, this international centre its network consists of a Deputy Coordinator for Education, who is also responsible for the Portuguese Language Centre Diogo Cão, and the Portuguese Language Centre at the University of Namibia, both in Windhoek. In 2012, on request of the Namibian Government, a memorandum of understanding was signed between the Governments of Lisbon and Windhoek, on the adoption of Portuguese as a curricular option in the Namibian education system. At that time the project was implemented in nine schools for a total of 371 students. Currently, 21 schools and 1616 students are learning Portuguese. This memorandum of understanding was extended in 2016. In addition to the Memorandum of understanding signed between the Namibian Government and the Portuguese Government, there are other ongoing projects that demonstrate the importance of the Portuguese relations to Namibians: cooperation Protocol with the police and the teaching of Portuguese for employees of the Ministry of Foreign Affairs, since Namibia is an observer member of the CPLP. It is an innovative project based on the training of Namibian teachers in Portuguese language, who completed their training and are subsequently hired by the Namibian Ministry of Education to teach Portuguese in Namibian schools.